In an effort to save one of the world's most endangered species, conservationists in Borneo have been trying to capture and breed Sumatran rhinos -- a species on the verge of extinction. This week, officials made a huge gain in that program, with the capture of a wild female (one of only about 100 left) whom they hope will mate with a male at a rhino sanctuary in Tabin National Park. "The rhino fell into a pit trap dug at a site on a known rhino trail deep inside the Danum Valley Conservation Area about six hours' walk from Yayasan Sabah's Borneo Rainforest Lodge," Sen Nathan, Assistant Director and Veterinarian of Sabah Wildlife Department told the Daily Express. According to Mongabay, officials are hopeful -- but realistic. According to more recent media reports, the rhino is in good condition. The female is presumably an individual that conservationists have been monitoring for years and attempted to capture several times before this. They are hopeful that she will mate and reproduce with Tam. However, they have been disappointed in the past: another female, Puntung, has yet to become pregnant by Tam despite the best expertise and technology available. Given these difficulties, officials in Sabah were openly talking about moving Tam to Cincinnati Zoo-currently home to two individuals-to mate with the resident female there. However with the successful capture of a wild rhino, this may be on hold. 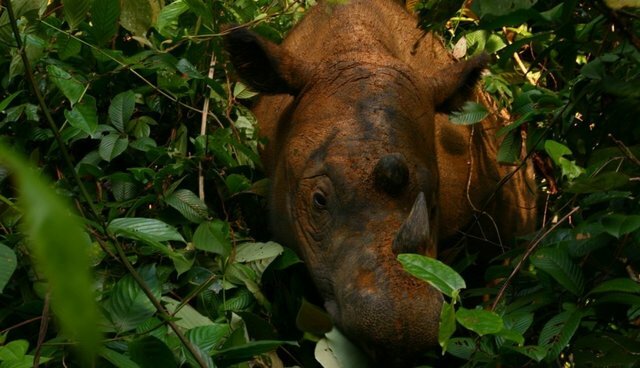 Sumatran rhinos are imperiled by deforestation and poaching -- and now, because there are so few of them left, it is difficult for remaining individuals to meet and mate with other rhinos. Conservationists have scrambled in recent years to save the world's smallest rhino species with this breeding program, which has so far produced just one baby rhino in 2012 at Way Kambas Rhino Sanctuary in Sumatra (three others were born at the Cincinnati Zoo in the past century).